Take Route 80 to exit 12 to Hope. Turn onto Route 519 north at blinking light. At third right, turn onto Shiloh Road. Approximately 1 mile, turn right onto State Park Road. 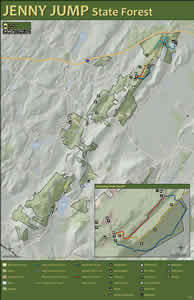 Jenny Jump State Forest is located in Warren County along the stunning rolling terrain of Jenny Jump Mountain Range. Panoramic vistas of the Highlands and the Kittatinny Mountains and Valley to the west, and scenic views of the Great Meadows in the east dramatically greet the visitor who climbs the narrow path leading to the top of Jenny Jump Mountain. Rocky outcroppings and boulders line the trail - evidence that great glaciers once covered what is now known as Jenny Jump State Forest. Jenny Jump State Forest facilities are partially accessible for people with disabilities. Please contact the forest office for further information regarding disability access. Text telephone (TT) users, call the New Jersey Relay Service at (800) 852-7899. Office Hours: Monday through Saturday 8 a.m. to 4:30 p.m.
Glaciers receded from Jenny Jump Mountain near the end of the Wisconsin Ice Age, about 21,000 years ago. Exceeding a mile in thickness, the ice advanced southward from Canada, gouging out valleys and rocks from mountain tops, incorporating sediment, boulders and debris into its mass. Much of this debris was carried by the glacier or transported by meltwater to the edge of the ice where it was deposited in huge ridges called moraines. The dramatic effects of this can be seen in Jenny Jump State Forest. The United Astronomy Clubs of NJ (UACNJ) leases property from the NJ Department of Environmental Protection and in 1995 completed the Greenwood Observatory. The UACNJ provides public programs on Saturday evenings from April through October, from 8:00 to 10:00 pm, at which an astronomy presentation is followed by an observing session, weather permitting. Eleven miles of hiking trails and three miles of hiking /mountain bike trails offer magnificent views of the mountains and scenic Mountain Lake. The Summit Trail, at an elevation of 1,090 feet, offers a view of the Delaware Water Gap and the Pequest Valley. Campsites: Twenty-two tent and trailer sites with fire rings and picnic tables. Showers and toilets are within walking distance. Open April 1 to October 31. Fee: NJ Resident $20 per night; Non Resident $25 per night. Campsite reservations can be made 11 months in advance, reserve early to secure the most popular sites. Call the office at (908) 459-4366. When making a reservation please have your drivers license number, vehicle license plate number and credit card ready. Group campsites: Two group sites containing fire rings, picnic tables, and pit toilets. Campsite A accommodates up to 25 people. Open April 1 to October 31. Fee: NJ Resident $50 per night; Non Resident $100 per night. Campsite B accommodates up to 40 people. Fee: NJ Resident $80 per night; Non Resident $160 per night. Open April 1 to October 31. Shelters: Eight shelters near the top of Jenny Jump Mountain, with furnished living room with woodburning stove, two rooms each with double-deck bunks. Showers and flush toilets are located nearby. Outdoor grill for cooking, picnic table. Each accommodates four people. With prior permission from the superintendent, two additional people may be accommodated. Open year round. Check in time is 2 p.m. and check out time is Noon. Fee: NJ Resident $48 per night; Non Resident $60 per night. A car-top boat launch at Ghost Lake provides access to excellent largemouth bass, sunfish and catfish fishing and access to Mountain Lake is available for shore line fishing. The Division of Fish and Wildlife stock trout at Beaver Brook 4 times during the spring trout season. Favorable habitat for deer, turkey and small game offer excellent hunting opportunities for the sportsman. Hunting is permitted in designated areas within the park and is subject to Division of Fish and Wildlife regulations. A small picnic area is available in a quiet, shaded area of the park. Tables and grills are available for patrons. Alcoholic beverages are prohibited. This area has frequent sightings of black bears. An educational brochure is available at the park office.